To keep this post from getting even longer, I have decided to split the recipe in two – below you will find the recipe for the Corn and Blueberry Swirl Ice Cream, delicious on its own. If you want to use the ice cream to make ice cream sandwiches, next week, I will post about the Corn Cookies I used for these. Ca. 30 corn cookies, each slightly larger than a single ice cream scoop, frozen (for easier handling). 1. For the corn ice cream , place the corn kernels, the cobs, 100g of the sugar, milk and cream in a saucepan and heat to simmering point. Turn off the heat and leave to infuse for 1 hour. Discard the cob and puree the mixture using an immersion blender. Pass mixture through a fine sieve and make sure to squeeze the corn kernels hard to catch all their juice. Return mixture to a saucepan and heat to simmering point on a medium flame. 2. While the corn mixture is heating up, whisk the egg yolks with the remaining 60g sugar and the pinch of salt until frothy. Add a large ladle of the hot corn mixture to the egg yolks and whisk to combine before pouring into the saucepan with the corn mixture. Stirring continuously, cook the custard for ca. 10 minutes on a medium flame and until thick enough to coat the back of a spoon. 3. Pour custard into a bowl set in an ice bath and leave custard to cool for at least four hours before churning the ice cream. 4. To churn the ice cream, either pour the ice cream into an ice cream maker and follow the manufacturer’s instructions or pour the ice cream in a sealable container and place it in the freezer, stirring vigorously with a fork every 30-60 minutes to ensure an even distribution of small ice crystals in the ice cream (I followed the latter route and was very happy with how creamy the ice cream turned out). 5. For the blueberry compote, place the blueberries, sugar, lime zest and lime juice in a pan on medium heat. Stirring continuously cook on medium heat until the sugar has dissolved and the blueberries are starting to break down. Add the cornstarch and stir to combine. Bring mixture back to a boil, wait until the mixture is no longer cloudy and the juices have visibly thickened (ca 60 seconds). Turn off the heat and let compote cool to room temperature before swirling it into the ice cream. In terms of timing, I would make the blueberry compote as soon as the custard is set aside to cool down – this will allow the compote to be ready and cooled down to room temperature once it is time to swirl into the ice cream base. 6. 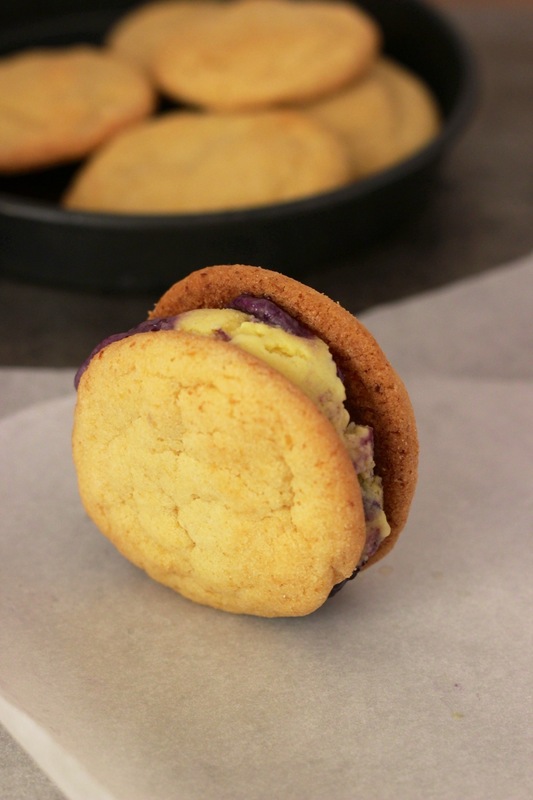 To make the ice cream sandwiches, place a single scoop of ice cream on one cookie and top with a second cookie, pressing down to flatten the ice cream scoop (but not so much that the ice cream squirts out the sides). 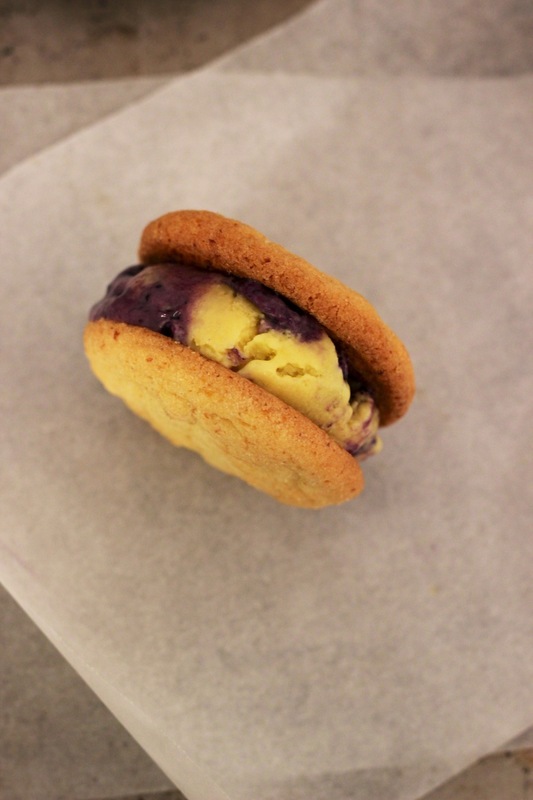 Wrap ice cream sandwiches in greaseproof paper and place in the freezer where they should keep a few weeks. Haha, you mean the same way that not bringing an umbrella will almost guarantee heavy rainfall? Good luck with influencing the weather gods but I guess that even if you don’t succeed at least you can find solace in eating ice cream pies! If you want to follow the original NYT recipe I can highly recommend passing the infused milk-cream mixture through a sieve before preparing the custard – the pureed corn kernels make it a bit hard to tell whether the custard has reached the right consistency or needs to cook further!